The Faroe Islands – in Faroese Føroyar means “the sheep islands”. The archipelago is under the sovereignty of the Kingdom of Denmark, situated in the North Atlantic Ocean, approximately halfway between Norway and Iceland. The 18 mountainous islands have a coastline of 1.289 kilometers and nowhere on the islands is the distance to the sea more than five kilometers. The close proximity provides the visitor with a variety of experiences of nature – from dramatic landscapes meeting the wild ocean to the peacefulness of the mountains to the nightlife of the capital Tórshavn. The largest island is Streymoy (375.5 square km) with Tórshavn at its south-eastern end. The Faroe Islands have been a self-governing country within the Danish Realm since 1948. Over the years, the Faroese have taken over control of most domestic matters. Areas that remain the responsibility of Denmark include defence, police, justice, currency and foreign affairs. The Faroe Islands also have representatives in the Nordic Council as members of the Danish delegation. The population of the Faroe Islands is about 49 000. With a population density of 34,5 per square kilometer, the Faroe Islands have the second highest population density of the Nordic countries after Denmark. 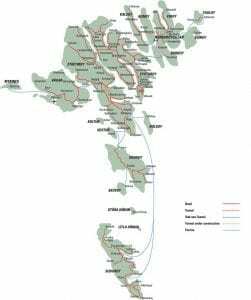 The Faroese settlement pattern is characterized by a large number of densely populated villages of varying size. The largest town is the capital, Tórshavn, with about 19.900 inhabitants. The second largest is Klaksvík with about 4.800 inhabitants. In the twentieth century Faroese became the official language in the Faroe Islands, and is used in all matters – also within business, administration, political and cultural life. It is a language closely related to Icelandic, Norwegian, Danish and Swedish. It is closest to the Icelandic languages and when Faroese and Icelanders speak together each in their own native tongue there is good degree of mutual understanding. Danish is the second language and practically everyone can speak and write Danish and most people are capable of communicating in English as well. Before the Reformation the Wake of St. Olav was an important religious festival in Norway and the Norwegian tributary countries. In most places he has been forgotten and now only figures in books about history; but in the Faroes he was so revered that to this day his wake is celebrated in the capital of the islands – the Olai Festival. Over the years the festival has grown and in order to accommodate all the activities on the program it now starts on the eve of Saint Olav’s Day. On the afternoon of the 28th the festival is officially opened with a procession through the town headed by men on horseback with the Faroese flag at the forefront. After this comes the eagerly awaited boat race where the final result of the summer’s competitions will be decided and the champions of the year celebrated. Sporting events, and concerts follow in a tightly packed program, but the item which gives the greatest pleasure is to walk in the main street and follow along with the stream of people dressed in their best, often national dress.